Preparations for Maker Faire include generic pins and stickers. 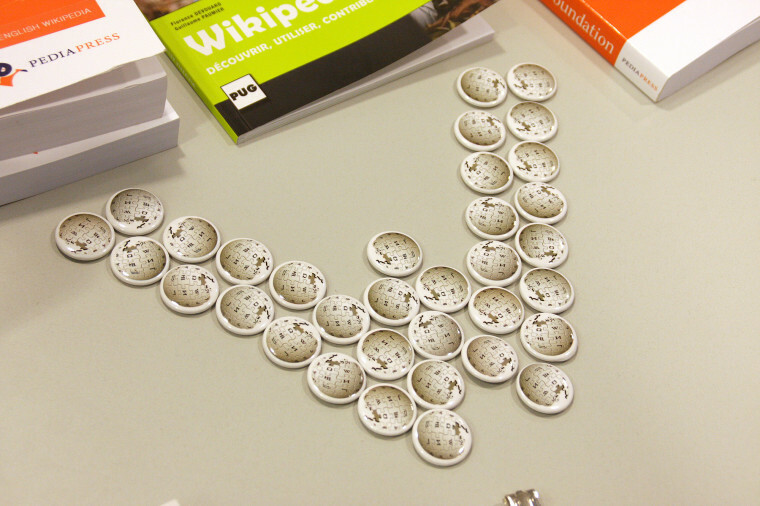 Last week-end, I attended my first meet-up of Wikimedians from the San Francisco Bay Area. It happened at the same time as a meeting of the Board of Trustees of the Wikimedia Foundation. It also happened at the same place, i.e. the office of the Foundation (where I work). A couple of topics were discussed during the meet-up, notably the next Maker Faire, the next meet-ups and the possibility of organizing a regional Wikimedia conference later this year, probably around November. I am also going to try and promote Commons as much as possible while I'm here. As people were talking about the need for various kind of documents and goodies to hand out at the Maker Faire, I realized that we could organize a Marketing Marathon during the next meet-up. The goal would be to write together the content of documents, based on pre-arranged templates so that it fits with the design. I have to admit my other responsibilities within the Wikimedia movement have distracted me quite a bit from the Wikimedia documents initiative I launched in May last year. It would probably have helped a lot if some people had responded to my call for volunteers. Not only would it have saved time, but it also helps immensely when other people are interested in your work: it puts some friendly pressure on you. The Marketing Marathon proposal was well received and we agreed to organize it as part of the preparation for the Maker Faire during the next meet-up. I now have volunteers willing to help, and a draft timeline with the next meet-up and the Maker Faire. Besides, I hope to benefit from the research made by the Bookshelf project, which already answered one of my questions: what standard format to use for documents intended for an international use. If you would like to help, or if you think you have good ideas, feel free to contact me. Wikimedia conference chapters meeting 2009 9124 by Elke Wetzig, under CC-by, from Wikimedia Commons.